We know Google can build phones, tablets, laptops, thermostats, watches, smart glasses (sort of) and driverless cars, but can they build a city? 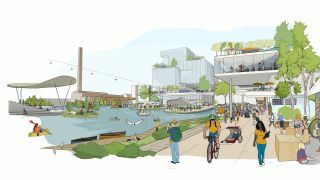 Over the next few years, we’ll find out: Sidewalk Labs, a subsidiary of Google’s parent company Alphabet, was last year selected by Toronto officials to create an 83-acre smart neighborhood just east of downtown. The project, which will begin with a $50m (about £38m pounds or AU$70m) pilot scheme later this year, aims to transform a traditionally industrial area on the edge of Lake Ontario into the world’s most ambitious smart city. It’ll combine the latest tech in transport, infrastructure, and construction in one place, all built 'from the internet up'. The plans are outlined in this 196-page vision document – but don’t worry, we’ve gone through it with a fine-tooth comb to pick out the bits that you need to pay attention to. Here are the five innovations you should keep an eye out for. Sidewalk Labs doesn’t want a single delivery vehicle cluttering up its new neighborhood. Instead, all deliveries will be handled by a network of underground robots that run along utility lines and bring your post straight into a personal mail locker in your building. Any deliveries will first be routed to a centralized distribution centre. Then, they’ll be placed on the underground network, which will ferry goods to both residents and businesses in the area. “Each delivery would be routed according to its level of urgency, perishability, or priority, and additional modes might be employed, such as delivery bikes and aerial drones,” Sidewalk Labs says. The aim is to reduce congestion on the roads and ensure that packages arrive on time in one piece, without any missed deliveries. Delivery robots aren’t new – a company called Starship Technologies began delivering food to workers on demand in Silicon Valley earlier this year, to give just one example – but Sidewalk Labs’ plans are the most comprehensive we’ve seen yet. The streets of Sidewalk Labs’ city will be packed with sensors measuring congestion, footfall, and traffic patterns. That data will enable some neat tech, like 'dynamic' streets and pavements that can change width based on demand from cars and pedestrians. The plan is to embed LED lights on the streets that will change color to alter the width of roads, pavements, and cycle lanes, each of which will have a designated color. If sensors detect that there are barely any cars but lots of pedestrians, then the pavement could be widened at the expense of the road, as shown in the diagram below. This will also allow for temporary bike lanes to pop up on demand. As far as we can tell, this is the first idea of its kind. It’ll be joined by traffic lights that change their signals based on road use – currently being tested in Sidewalk’s Semaphore Lab – and a parking app that will direct drivers to a free spot. Canada is known for its extreme climate, and Toronto is no exception. It’s hot in the summer and almost unbearably cold in the winter. Sidewalk Labs wants people to spend more time outside whatever the weather, and it’ll encourage that with the help of technology. To keep pedestrians dry, it will install canopies above both public spaces and walkways that will extend and retract depending on real-time weather data. The idea is that the canopies come out when it’s wet and retract when the weather picks up, and they could equally be used to create shade in the summer. The new neighborhood will also include walkways and cycle paths with underground heating, so that pedestrians and cyclists can get around even when it's icy. The company will have existing case studies to draw on: Reykjavik, Oslo and Sapporo in Japan all heat some of their pavements to keep the snow away, and Montreal is just about to launch a pilot project that will install heaters in a 670m stretch of downtown. In the past, these projects have either been electric or, in the case of Reykjavik, powered by thermal energy harvested from hot springs. How Sidewalk Labs plans to power its heated streets remains to be seen. Driverless cars are, unsurprisingly, central to Sidewalk Labs’ plans, and it wants to create a network so comprehensive that less than one in five residents feel the need to own a car. For long-distance journeys it will ensure that residents can easily order shared hire cars from companies like Zipcar, but for local journeys it wants everyone to use a fleet of autonomous vehicles called taxibots. Residents will be encouraged to share rides in 'taxibots', with Google-owned Waymo likely to be involved. These taxibots will be available on demand via your smartphone, and will generally be shared with other riders in the area. You’ll be able to specify whether you want to travel alone – presumably for a higher fee – and lower-income residents will get discounts on their rides. You’ll be able to book them in advance, too. The vehicles will vary in shape and size, from regular cars to “small van[s] of six-to-twelve seats”, and even single-person vehicles that are “more like a bike than a car in size”. Sidewalk Labs says it’s open to working with third-party autonomous car companies, but we’d expect Google’s own driverless car project, Waymo, to be a perfect fit for the area. Sidewalk Labs wants its buildings to be as flexible as possible. To do that, it will build them with strong skeletons and minimal interiors that can be reconfigured on the fly. Support beams will be placed at regular intervals, which will allow walls, floors, ceiling panels and façades to move easily. A single building could include flats, offices, manufacturers, a hotel and shops, with the proportions shifting according to market demand. It’s unlikely that the balance of a building will be in constant flux, but the system will allow individual retailers to change their stores as often as they want, and in response to what customers are asking for. Shops will be able to “expand or collapse quickly, and at low costs, as the population grows and retail trends change”, Sidewalk Labs claims. They would also be able to reconfigure their interiors if they wanted to highlight a new product, or simply to change the layout. For those looking for more temporary space, the neighborhood will include a “tech-enabled” marketplace that smaller shops and pop-up stores can reserve at short notice. This area has a bit of a silly name – NextGen Bazaar – but it could be a win for both retailers and shoppers. Retailers get to try out new product lines without paying for the overheads of a physical store, while shoppers get to sample an always-changing array of food and other goods. It’s worth remembering that all of Sidewalk Labs’ ideas are at an early stage and, while they’re exciting, they’ll have to go through years of testing before we see them in action. We’ll get our first glimpse of its vision of the future soon, with work on the £38m pilot scheme, which will test some of the tech outlined above, rumored to be starting as soon as this summer. Watch this space.